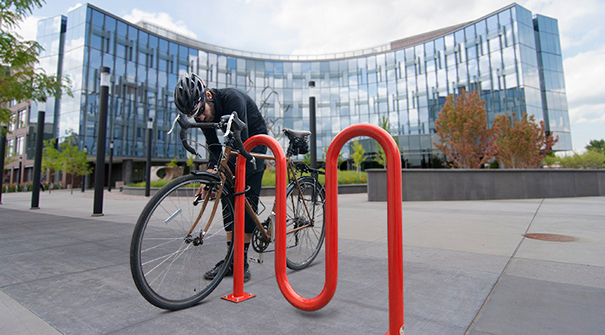 With a modern simplicity, the Rolling Bike Rack balances aesthetics and functionality. Universal design with round steel tubing, the Rolling Rack provides ideal security, stability and two-way parking access for 5 to 11 bikes. 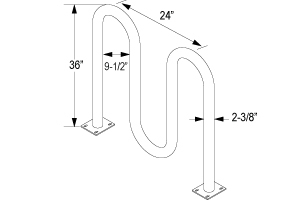 Measuring a height of 36", the rolling 24" wave pattern is adequately spaced to allow easy pull-in parking, supporting just about every type of bicycle and popular bike locks. Constructed with 2.375"O.D. 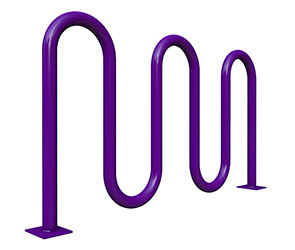 round steel pipe, this commercial bike rack is available in highly durable, non-corrosive finishes to best suit various facility needs. Set the standard for efficient, secure and modern bike parking for schools, community centers, streetscapes and parks with the Rolling Rack.